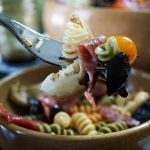 Antipasto Pasta Salad - this salad contains all the flavors of your favorite Antipasto Platter but in a salad! Big flavors with just a little work, it's delicious and super easy. It really is a meal in itself or a great side dish at a barbecue. If you like a great salad with tons of flavor, this is an excellent choice and and easy to make! Cook pasta according to package directions to al dente. Drain well and rinse with cold water to stop the cooking process. Drizzle with olive oil & seasoning salt. Mix well & refrigerate until cool. While the pasta is cooling, slice the deli meat into small bite sized pieces. Chop the olives & tomatoes, slice the artichoke hearts also. Drain the giardiniera and chop also. Lastly cut the tips off the figs & discard. Chop them into small bite sized pieces. Add all the pasta and the rest of the ingredients to a salad bowl and top with the salad dressing. Instructions - salad dressing - Add all of the ingredients to a screw top jar. Shake well to combine. This dressing will keep well in the refrigerator for 3-4 days.